An overstimulated society has given birth to a new design trend and it’s called Transcontemporary. Transcontemporary design is a blend between contemporary and transitional architecture and design. It encompasses: strategic austerity, neural palettes and natural elements, a greater connection to nature, and an increased sense of privacy. What drives Transcontemporary design? Simplicity via sensorial reduction. Design is constantly evolving but the origin of these changing trends is rarely the topic of discussion. Before we get into the explicit details of what Transcontemporary design involves, we’d like to talk about how it came into existence in the first place. People love design. We are consumers and inventors by nature, and images and visions of beautiful homes fascinate us. But people don’t usually consider how cultural and economic influences give birth to the very trends they end up appreciating. Today’s society is both enthralled and overwhelmed with technology. We’ve created worlds within worlds, from the laptops, phones and smartwatches we carry. Like the man who walks across a tightrope, our experiences tether between the real world and the virtual ones we sign into. We are overloaded not just with information, but with imagery. A recent study from the University of California, entitled “Measuring Consumer Information,” by Roger Bohn & James Short, found that on average, we as consumers are taking in 34 gigabites of information everyday. This equates to approximately 100,000 words per day. The number of devices we have is steadily increasing and thus fragmentation is even more compounded. In app texting is probably one of the biggest culprits of this. We’ve become a culture with a lot of conversation: with each other, to each other and some of it, is at each other. The Nielsen Company, a global marketing research firm, found that we’re consuming about 10 hours of screen time a day. This virtual overload, in the form of imagery overload, means that we accumulate a lot of mental clutter. 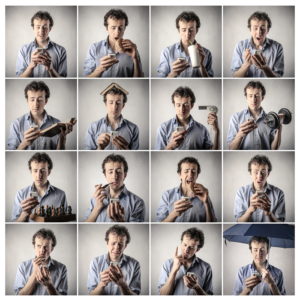 This clutter affects and disrupts our focus. Renee Labbe, a Forecast Strategist for Boral Roofing says that, “We overlook it because we like it.” Backlit LED screens emit blue light, and optometrists contribute blue light to be a part of something known as digital eyestrain. Transcontemporary seeks to be the design directive that can step in and be an antidote to these problems by providing sensorial reduction. The attention to less is the moving trend. There is a marked intention towards less clutter. We are seeing a reduction of palettes, as well as a reduction in color saturation. Limited contrast is another element of this, because the depth of field in a visual is no longer really being competed for. This is just one example of how we have cause and effect. The United Nations has a lot of insight to share in reference to human overload. Based on the current projections, by 2030, roughly 2/3 of the population of the world will be living in major cities. Urban density is a catalyst, and it’s an economic influence that we are all anticipating will be more and more a part of our future. But what kind of effect does this have on consumers? This equates to a loss of privacy and an increased loss of nature. These 2 things are critical in helping us maintain mental balance and allows us to think more clearly and critically. Cities are known to have some correlation to strain on our mental wellness. The magazine is published by the Deutscher Ärzte Verlag, which is co-owned by the German Medical Association (Bundesärztekammer) and the National Association of Statutory Health Insurance Physicians (Kassenärztliche Bundesvereinigung). When you have an increased loss of privacy and loss of nature, design can step in and be an antidote. Highrise trends are a lot more digestible when you understand the functionality and purpose behind them. 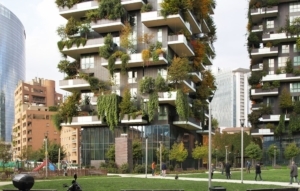 Foliage is being used as a privacy barrier between tenants’ outdoor spaces, to increase each individual’s connection to nature, thus easing the connection and congestion of cities overall. In single family homes, we are seeing this in the way of courtyard constructions and an increased visibility of more outdoor views. Thus creating a more enclosed and private outdoor dwelling. There is an increased movement towards decluttering and clean lines. It’s not just about minimalism overall, it’s about less clutter. By eliminating a few things, not necessarily everything, we are able to look at what’s there and making subtle changes to remove some of the visual clutter that contributes to a lack of focus. Could this mean that with some design initiatives we have the ability to improve an entire society’s state of mental health? It could very well be. Transcontemporary has a big emphasis on natural palettes and the use of more organic materials. Warm trends are diminishing, as cool colors are taking over. There was no record of the color black in design in 1990 but there is now. There was a bigger use of more yellows in the 1990’s than there was in 2016. There are still warm colors within today’s color palettes but they are approaching a more neutral interpretation of that color. Recessions have their own contribution to design directives. 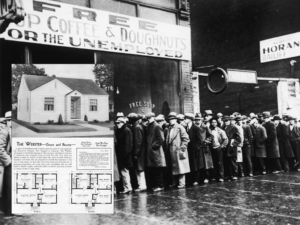 The great depression lead to the start of modern architecture. 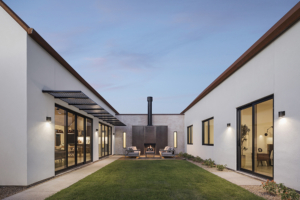 The minimal tradition is characterized by single story homes, that have minimal ease overhangs, are with or without a chimney, with little ornamentation to the visual facade. The front of the home either has a simple porch or no porch at all. The 2008 recession home styles began to reflect the same characteristics from the years closely following the great depression, known as “The Barn Home Vernacular.” As so, history continues to repeat. Gable Modern, where we are today, is very austere. It implies strategic reduction and its facades include rural and natural inspired aspects. 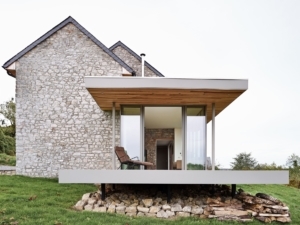 It is a very contemporary twist on that vernacular style. Transcontemporary is a new expanding culture. The shape of the homes pulls from transitional homes, where contemporary homes are much more boxy in comparison. One color exteriors are becoming more common in a way to achieve a reduction in the numbers of colors in a palette. What’s become common in remodels to already existing homes is more single color exteriors, no shutters or removed shutters, increase in windows from the backyard, less windows in the front of the home, and the trims and door are one color, in order to achieve a more uniform look. Some people are probably afraid of the idea of minimalism but minimalism doesn’t have to be so extreme. There’s many ways to handle minimalism, that can evoke a sense of calm and soothing and won’t be deemed as sterile as many people think of it to be. We are seeing the implementation of more rural aspects, in hopes of increasing a sense of privacy for homeowners. 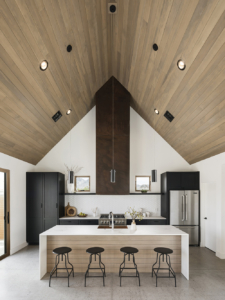 Natural ease is often expressed in wood, so in addition to an increased use of wood, both inside and outside the home, other materials are also becoming more relevant, such as raw stone or rough cut stone. A great example of this would be the Row Houses in London, where remodels are all about the glass in the back, while the fronts of the homes still maintain their traditional look. People are craving more light and openness but wanting both more light and more privacy is a bit of a conundrum for designers. What this trend means for roofing is that the roof is now more of an inclusive consideration of the exterior aesthetic. Most houses used to have a 3-color palette but we are seeing people lean towards a 1-color palette, all throughout the home. Architectural characteristics have taken on more dimension. 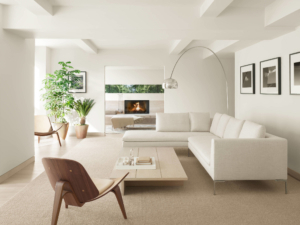 There is a big difference between calm and minimalist for interior design. It can always be more challenging to create a minimal or calming interior, because there is always this natural impulse where we want to add another thing here and another thing there. It takes a broader perspective to ask what are we are truly trying to achieve here. The difference between calm and minimalism is a lot about color, tactility and finish. You can have the same amount of objects, but in a calming interior, the palettes are softer. They will lean towards neutral, more cooler colors. The overall effect then is not sterility, but soothing. Neutrals have a natural aspect to them. One has to consider the way the color is finished and the textures combined with it. There are various aspects where you can create an effect that is austere but does not come across as cold. Common things we are seeing is sand as a color, as well as driftwood greys. The Gable Modern is still sitting in a space of early consumers. With Transcontemporary beginning to come to it’s own, people need to learn to blend these elements with their personal lives and use them to fulfill their needs. The Transcontemporary trend is still becoming but so far, it’s definitely provided a lot to think about, in terms of how our world has become and what we can do to find our place and home in it. You’ve made your point very well..
You’ve made your position pretty well.. Although web sites we backlink to below are considerably not connected to ours, we really feel they’re really worth a go as a result of, so have a look. Seriously quite a lot of useful information. Seriously many of very good information. Amazing all kinds of excellent knowledge!